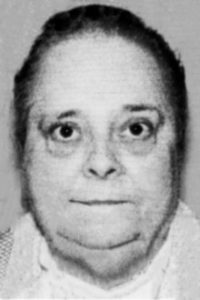 SABATTUS – Joline C. Loesberg, 75, of Sabattus, passed away on Nov. 1, 2018, at Montello Manor in Lewiston. She was born in Lewiston on May 5, 1943, to parents Armand C. and Fleur Ange (Boutin) Bissonette. Joline attended St. Peter’s Elementary School in Lewiston, and graduated from St. Dominic’s High School. She was a member of the American Legion auxiliary and was very involved in Girl Scouts for over 20 years as Troop Leader and Treasurer. When she was younger, Joline enjoyed woodworking and carpentry. She enjoyed playing BINGO and doing puzzles. She also loved animals, and especially cherished time spent with family, and at family gatherings for the Holidays. Joline was predeceased by her parents; a granddaughter, Teisha Loesberg; and her beloved dog, Muffy. Surviving her are her husband of 53 years, Paul Wayne Loesberg; daughter Denise and her husband John Poulin of North Carolina; granddaughter Tianna Simmons; and great-grandchildren Jenna and Timothy Simmons III, all of North Carolina. She also leaves behind and aunt, Constance Albert; and her cousins Sue and husband Ray Harps, and Michael Sasseville. A funeral service will be held at Open Door Bible Baptist Church, 26 Gartley St. Lisbon, on Saturday Nov. 10, 2018, at 11 a.m. A burial service will be held following the funeral at Pleasant Hill Cemetery.